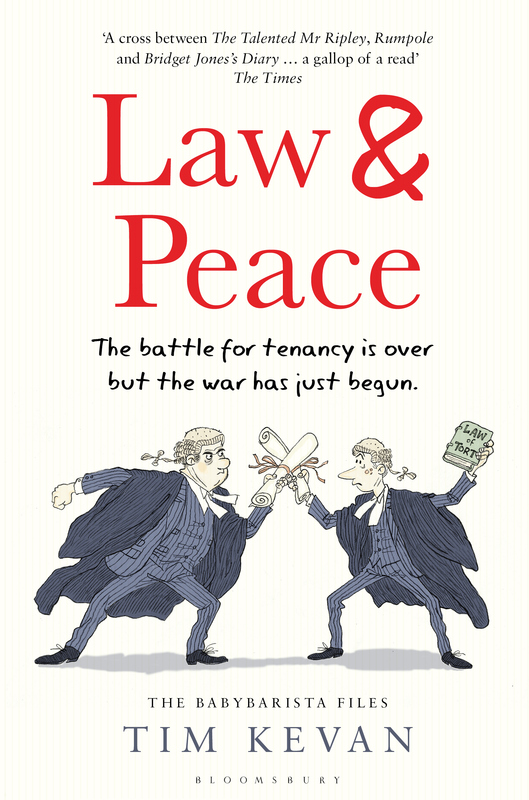 Very many thanks to TotallyLegal for letting me talk about my new book Law and Peace. You can read it here or below, and you can buy the book on Amazon. Having written my first BabyBarista novel Law and Disorder a little while back, last year I was faced with the task of writing book two. This came as more of a challenge than the first given that I couldn’t simply use the stresses and strains of pupillage to drive the plot along and instead had to look to other themes and stories. In the end, I did just what I’d done in book one and let the characters loose to tell their own stories. What eventually came out was Law and Peace, published by Bloomsbury this May and which thankfully has garnered some decent reviews with The Daily Maildescribing it as “highly recommended” and a “funny, sharp account of backstabbing Bar life” and broadcaster Jeremy Vine calling it “a novel bursting with invention”. The book follows BabyBarista’s second year in chambers in which as the newest tenant in chambers, he must face down old enemies, try to win compensation for a group of ASBO-attracting pensioners and unravel the complicated knots of his love life, not to mention his mother’s finances. Under the wise and watchful eye of OldRuin, he tries to keep his nose (and his wig) clean, but when SlipperySlope, an unscrupulous solicitor offers him a quick way out of his financial difficulties he soon becomes embroiled in blackmail, dodgy share-dealing and the dark arts of litigation. With his old adversary TopFirst out for revenge and the chance to be awarded a coveted ‘red bag’ at stake, BabyB has to use all the tricks of his trade to extricate himself from his legal quagmire, win the case for his mad old clients, and somehow convince his best friend to fall in love with him. One of the themes that comes out of the book is BabyBarista’s preoccupation with work and his failing to give enough time to his friends, family and other things which make him happy. In the end, it’s the example of others who show him the way with the old people taking him skateboarding and a friend of theirs introducing him to surfing as well as OldRuin, Claire and his mother emphasising the importance of love and friendship. It’s something which I’ve had time to reflect on myself having spent ten years at the Bar in London before taking what has become a prolonged break to move down to the sea in North Devon. This has allowed me to return to the much simpler country way of life that I had known as a child with time to get out into the surf and the countryside as well as to settle into the local community. I guess the thing about legal life is that it doesn’t necessarily need to end up being over-worked and stressful. But in a profession that bills itself out by the hour, there’s an inherent risk of it producing a tendency to commoditise what might be our most precious possession, that of time itself. As BabyBarista discovers, it certainly doesn’t have to be like that and during the course of the book he slowly starts to return to the things that really matter.